For the second time now, Delft University of Technology asked its researchers to throw their hats into the ring for the Delft Innovation Award, looking for the most innovative projects. Well, we had an afternoon to spare, so we filled out the application form for mathblogging.org. To our delight we made it to the final round of 24! Our chances might be slim (in 2009, this awesome invention won), but it’s already been a great experience! As part of the final round, Fred was interviewed about mathblogging.org and we’ll get a super-awesomesauce poster made for us! The clip will be on youtube sometime next week and we’ll be sure to keep you updated here! PS: If you’re an employee at TU Delft, you could even vote for us in the Public’s Choice Award, also starting sometime next week. In case you’re not following us on twitter, we find ourselves in the surprising situation that things are running quite smoothly on mathblogging.org. Therefore, we’re thinking about new features — and we want your input! Please leave a comment, send us an email or send us a tweet with ideas on how we can serve the mathematical blogosphere better! As you might have noticed, we are experiencing some downtime on mathblogging.org — once again we’ve hit the limits of our bandwidth. We’re looking into the causes and we’ll be back with an update as soon as possible. Update: We’re still not absolutely sure what happened. The cause of our outage is simple: we had depleted our daily quota for both CPU hours and incoming bandwidth. That’s different from our previous downtime where the sudden popularity via yCombinator led to the depletion of our outgoing bandwidth. From what we can see right now, two reasons come to mind. The plausible one is that our update last week came with a bug; we probably did not estimate the effect of the new functionality correctly. This thought is supported by the steady increase in bandwidth use since our update. In fact, we only now noticed two shorter outages that we missed both yesterday night and the night before that. Ironically, it might be that the bug came with our efforts to reduce bandwidth (via more efficient caching etc). But such is life. The much less plausible scenario would involve blaming somebody else, i.e., somebody else’s misdirected script activated our (unprotected) update mechanism for the feeds; given what we can see so far, this scenario does not seem likely but who knows. Right now we’ve just spend some time to write fixes for both scenarios. Local testing looked good, but we’ll have to wait until the daily quota resets in a couple of hours to see what the reality of things looks like. We’re sorry if this caused anybody any inconvenience. We’ll keep you updated here and on twitter. We did some spring cleaning. 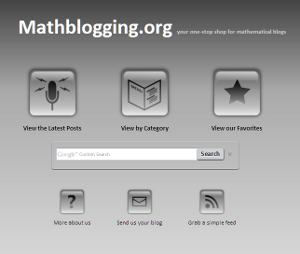 When we started Mathblogging.org, we had lots of different views in mind (still have), so we thought we would run out of space in the top menu immediately. Well, about two months later we still only have three views, and it is kind of annoying to have to go to a sub-menu to access them. Also, at the beginning we had the feeling that any category had to be justified and explained. It turns out they are quite self-explanatory. Therefore, we removed the comments at the beginning of the categories and for now put the views directly in the top-navigation. The observant visitor will also see that the link to the about-page disappeared and instead there is now a link to this blog. And if you look even closer you might see that this blog changed names, as we intend to write more generally about math-blogging (like the Weekly picks), and not exclusively about the development of Mathblogging.org. We completed the planned facelift! Using the search box on the front page, you can now search the full text of all the blogs on our index! The table of contents on the category view makes it easier to navigate the huge category view. And the new icons make the front page a nicer website to look at. What better way to start the first post here at our new developers blog for mathblogging.org than with an explanation why our site was down for a while today? We had planned to start this blog for a while now. But today’s outage gave us the right motivation. For the first time we exceeded the free quota of the Google App Engine! The people over at Google were kind enough to give us another free quota for the day so hopefully not too many people hit the brick wall of “quota exceeded”. Well, after barely using 1% of the outgoing bandwidth so far, you can imagine that we were a little surprised by the jump today. We’re guessing this was spawned by this tweet from the wonderful Sarah Kavassalis of “The language of bad physics” fame over at the PLoS blogs. It seemed to have piked when Hacker News at ycombinator.com got wind of it. Well, what can you do? To finish the good news, twitter tells us that at least 50 people have bookmarked mathblogging.org on delicious! That’s probably 47 more than before ;). We’re certainly looking forward to spending more time communicating about little project here as well. If you know of other interesting places that mentioned mathblogging.org, make sure to leave us a comment! You are currently browsing the announcement category at Mathblogging.org -- the Blog.